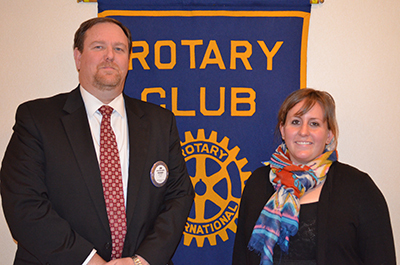 Cameron Acheson, outreach instructor for Auburn University's Rural Studio, spoke to the Auburn Rotary Club about the program's impact in West Alabama's Black Belt region. An off-campus design-build program in Auburn's College of Architecture, Design and Construction, Rural Studio has since 1993 been striving to realize the philosophy that everyone, both rich and poor, deserves the benefit of good design while giving architecture students a more hands-on educational experience through assisting the underserved in West Alabama. The Studio has evolved toward more community-oriented, multi-year, multi-phase projects spanning three counties. The students work within the community to define solutions, fundraise, design and, ultimately, build remarkable projects. Pictured with Acheson is club president Jim McLaughlin. For more information about Rural Studio, visit www.ruralstudio.org.